To increase post-secondary opportunities for first-generation, low-income, and/or undocumented students through tackling systemic barriers, changing policy and building coalitions for change. Read about our initiatives and network in the New York Times, the Atlantic, the Chronicle of Higher Education, the Hechinger Report, and more! We run the two largest first-generation, low-income student conferences in the country: the 1vyG Conference and the EdMobilizer FLI Conference. Every year, hundreds of students, administrators, and organizations gather to build community and work to improve FLI support systems on campuses across the nation. Past conferences have been held at Brown (2015), Harvard (2016), Yale (2017), Stanford (2018), and University of Pennsylvania (2018) . "[The] Fourth conference of IvyG network is a far cry from the first one... They have claimed real estate (at Brown and Penn, literal centers) and are methodically labeling the barriers they wish to dismantle. As a group last year, they got top colleges to waive application fees without making students detail family hardships [#NoApologies Initiative], which they found humiliating." Through direct advocacy, innovative programming, and sustainable coalitions, we aim to use our platform and our network to tackle institutional barriers facing low-income and first-generation students. In February 2017, we launched a national campaign to automatically waive application fee waivers for first-gen and low-income students. 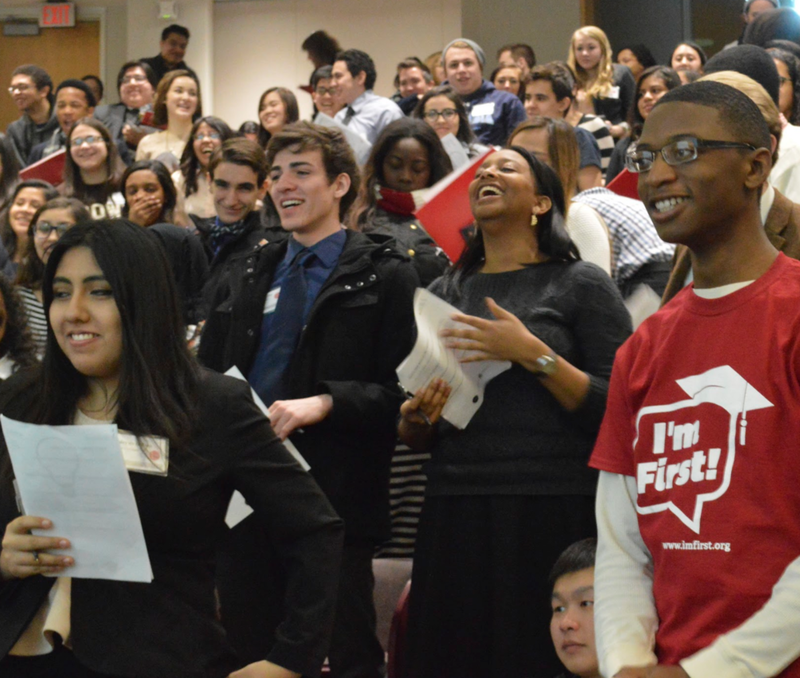 We coordinated with 14 universities to set the goal of increasing the number of FLI applicants to college. We know first hand the barriers that students face do not end at university. Our Next Frontier Initiative is a series of interactive webinars by low-income, first gen alumni specially for low-income, first gen students. Whether it's graduate school, jobs, or fellowships, we want to ease the transition for FLI students into life after college. Drawing inspiration from the Jack Kent Cooke Foundation's True Merit report, our coalition coordinated the largest national push to re-evaluate the college admissions process, including the role of legacy preference in it. Our newest initiative hopes to elevate the stories of FLI students at various stages of their lives: from applying to college to interviewing for jobs. In these moments of transition, we hope sharing stories of other FLI students succeeding and struggling will inspire those to come to keep fighting for their dream. Keep up to date on our latest national campaigns, when our next conferences are, and our newest programming! Host a career webinar, come to our alumni panels, mentor a FLI student. We appreciate all the support you are willing to give! Donations will allow us to create webinars, content, and programming for FLI students across the nation.